I had to post their post a similar post, I do think with their nod to mid-century design and clean danish almost like lines and fine details, i do think they will be gems of the future, although i cannot vouch for their quality. 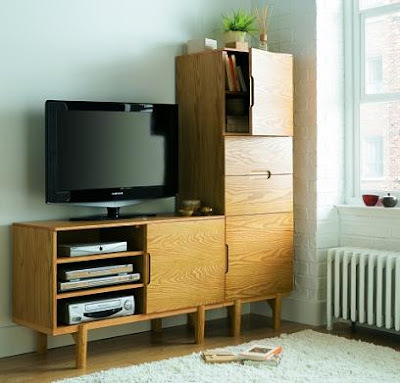 Prices range from £84 for a lamp table up to £211 for a sideboard. It is with sadness that I have just heard another great designer and Icon has recently passed away. 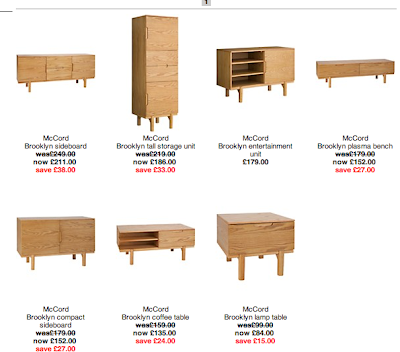 One cannot think of British design without thinking of the Days. They were ground breaking, trend setting before the word was even invented and inspirational to many designers. 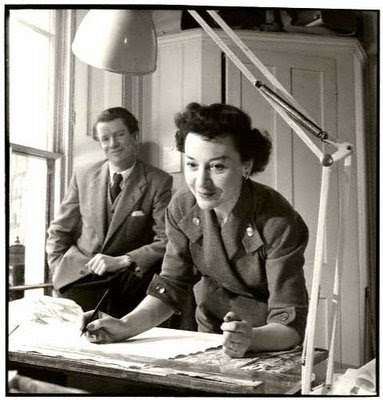 Lucienne Day was the wife of furniture designer Robin Day. The Days, considered to be Britain's most celebrated designer couple of the post-war era, were married from 1942. They are often compared to their American counterparts, Charles and Ray Eames. 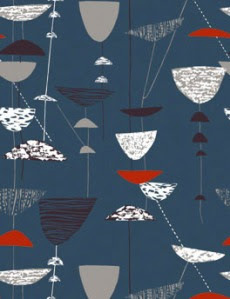 The development of their styles can be traced in Lesley Jackson's book Robin and Lucienne Day, published in 2001. 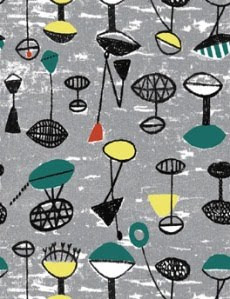 An exhibition of Lucienne Day's textiles and Robin Day's furniture, 'Robin and Lucienne Day: Design and the Modern Interior', will be held in Spring 2011 at Pallant House Gallery in Chichester - the city where the Days retired. Here is a clip from the orbiturary by the Guardian please click on the link below for the full article. 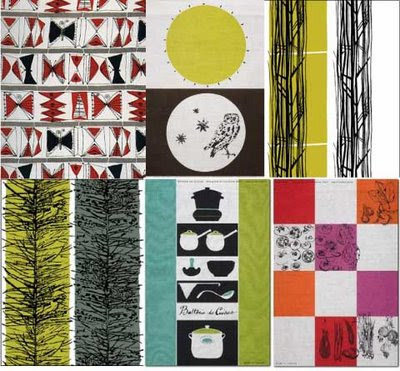 Lucienne Day, who has died aged 93, was the foremost British textile designer of her period. 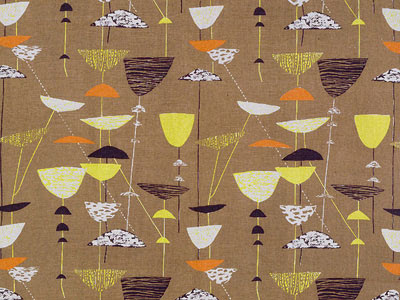 Day's furnishing fabrics, of which the most famous was the Festival of Britain abstract pattern Calyx, hung in every "contemporary" living room in Britain. The reality of "art for the people", dreamed about by the Victorian William Morris, was finally achieved by a female designer in the middle of the 20th century. Lucienne drew on the English tradition of patterns based on plant forms that went back as far as Morris. She took motifs drawn from nature – flowers, grasses, shoots, the intricate patterns of the landscape – and transformed them into something absolutely new. Part of their success was the implied message of regrowth and optimism for a Britain only just recovering from war. She was also deeply influenced by European abstract painting. 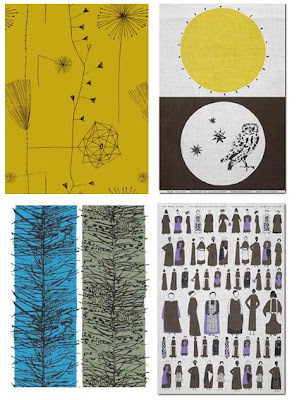 Her textiles speak the visual language of Kandinsky, Miró and Klee. It pleased her to think that people who could not afford to buy a painting for their living room could at least own a pair of abstract patterned curtains. Many of Day's printed fabrics were made in long production runs, which kept the price affordable. She made the link between mass production and fine art. Born Désirée Lucienne Conradi, she was brought up in the comfortable south London suburbs. Her mother was English and her father Belgian. She went to a convent school and always kept a distinctly continental reticence and chic. From a very early age she was focused on designing, and studied at Croydon School of Art and then, from 1937 to 1940, at the Royal College of Art. It was there, in her final year, that she first met the furniture designer Robin Day. Decades later they were still, very touchingly, describing that meeting as the start of a true romance. Perhaps the secret lay in Lucienne's professional autonomy. Their partnership was often, wrongly, compared to that of their contemporary American designers Charles and Ray Eames. Ray Eames's professional work was merged with, and in some degree subsidiary to, her husband's, whereas Lucienne's career was always distinct. 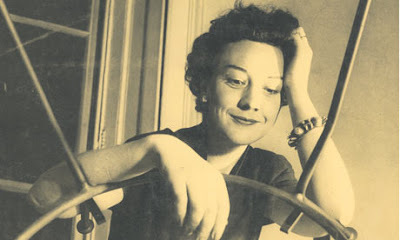 Lucienne set out on her career at a period when design was only just beginning to emerge as a recognisable profession. In that sense she was a pioneer. Her first freelance designs were for dress fabrics. But she quickly moved into the more democratic area of furnishing fabrics, broadening her scope to include carpets, wallpapers and table linens. Her work formed part of what she later described as a "tremendous surge of vitality" after the war. Her success was part and parcel of the Homes for the People movement, the Britain Can Make It exhibition, and the proselytising spirit of the Council of Industrial Design. Calyx, the first design that brought her real fame, was exhibited at the Festival of Britain in 1951. A large expanse of it hung in the Homes and Gardens pavilion, in the "contemporary" dining room designed by Robin. The pattern of free-floating cusps or mushroom caps, Lucienne's fresh interpretation of the geometry of nature, was screen-printed on linen. The original colouring – so redolent of the festival – was sharp yellow, orange, black and white on an olive ground. Heal's Fabrics were the manufacturers of Calyx. So unconfident were they of its success that they paid only half of the £20 that Lucienne had wanted to charge for the design. They had the decency to pay her the other £10 later, once the pattern had won a gold medal at the Milan Triennale and the international design award of the American Institute of Decorators. Day was the first British designer ever to have won this very influential American award. 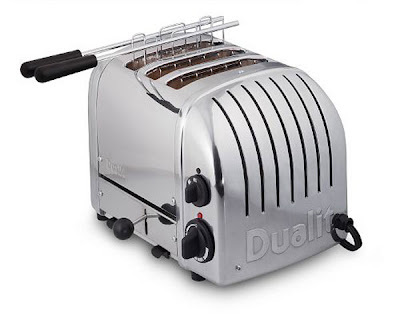 Continuing with items in my home am working through the kitchen at the moment and if there ever was a Best of British it has to be the Dualit toaster. 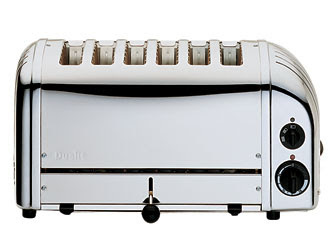 Dualit’s classic toasters are a design icon. Built for commercial use, they have since won numerous consumer accolades and come in a range of variants, sizes and colours. From the Vario to the enhanced NewGen and the more specialised Sandwich, Combi and Bun toasters, they all share the same timeless styling, reliability and Dualit design features. Engineered to produce the best toast in the world, Dualit toasters are still built by hand in the UK, with the assembler’s stamp on every base plate. So whether you’re a toast aficionado at home, or a professional caterer needing to produce 80 toasted sandwiches an hour, we can guarantee that one of our Dualit toasters will be perfect for you. It trully does make the perfect toast and its design is simply iconic.